Looking back on some of my earliest memories it becomes clear how influential my childhood experiences have been on the development of my work. The real influences for my artwork have often times come from sources outside of the art world: nature, the natural history museum, and fiction. Playing and building forts in the woods in Michigan and later in Florida set me on a path towards a deep respect for nature, the idea of exploring, and creating new worlds. Catholicism shaped the way I understand objects, it embedded them with a sacred or mystical presence. This respect for objects has led me to collect some small piece from most new places I go. I have collected my whole life and have often displayed my collections around my home in an altar like fashion. 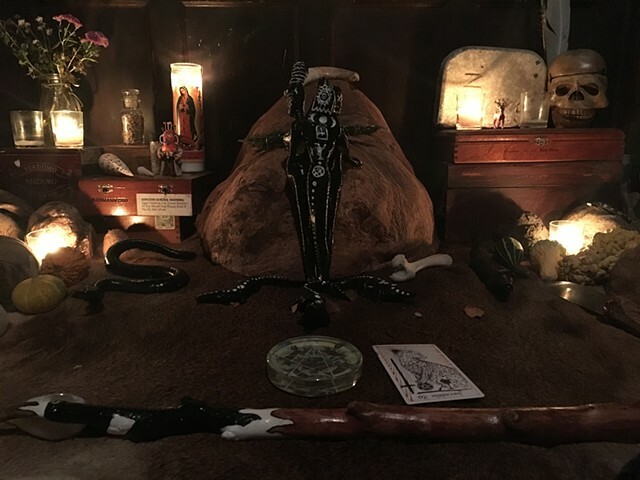 Within my work I create spaces within spaces, places of discovery where the viewer can physically leave one space and enter another: Voodoo, shrines, altars, Santeria, and cabinets of curiosity all inform the spaces I construct. The rooms I make are filled with souvenirs, and ephemera, objects that become memories of a person or place Ive been. The creepy place in the woods where you might find all this. My environments become a home for these objects, a place that holds my memories but also a place that can remind others of theirs - blurring the line between the creepy cabin in the woods and a place of childhood wonder and discovery. I create an art the viewer can physically enter. I allow the viewer to leave one environment, to enter another space physically and psychologically, and to enter another time and experience.